*How far along? 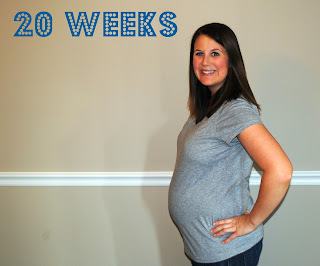 : 20 weeks...that seems crazy!! *Total weight gain? : 7 pounds at my last appointment..I'm sure that number has gone up. This dumb question may disappear from the survey soon! *Maternity clothes: wearing all maternity pants and hating them. It has been SO hot here already and I forgot how miserable the spandex panel is when it is above 80 outside. I would compare it to wearing a sauna suit. *Sleep: I have slept great all week and I figured out why! Jack has always slept in the bed with us because he is a spoiled rotten duman (dog/human) and he always likes to lay RIGHT next to me, under the covers. He is like a 7 pound heating pad. I've tried to get him to sleep next to Ben this week and it is so much better...I don't wake up sweating bullets! hooray! *Symptoms: nothing new really...other than it is really hard to reach my toenails. *Best moment this week: We figured out the sleeping situation for both boys...glad that is over! Baby Dos now has a new crib coming soon! oh, and I am 99.99% sure we have a name. Like so sure that I bought a clearanced PBK monogrammed stocking yesterday morning....and then got an email 12 hours later that it was completely out of stock. Is that a sign?! *Movement: not yet...I didn't feel G move until 23 weeks. I keep waiting to feel this little guy! *What I'm looking forward to: starting on G's new room! Oh, the second child. What they say about you is true. When we went furniture shopping for Grayson we bought one of the most expensive crib sets. This time? We settled for plain, sturdy, and inexpensive. 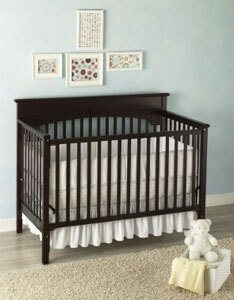 We bought a Grace Lauren Signature crib and it should be here in a couple weeks! We went back and forth trying to figure out the living situation for our boys. Toddler bed and crib? 2 cribs? New nursery for Dos? New room for G? We finally decided to keep the nursery the same so that Baby Dos can use it. We will just change out the personal touches for Grayson and make it special for this new baby. I'm in love with G's nursery and I am so excited to use it all again. 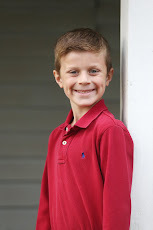 Grayson will be moving to one of our guest rooms and we will make it like a transition bedroom. I already know what big boy bedding I want for him & we will just work around that. I'm excited to get started! But, yes, he is staying in a crib for as long as he wants! Oh how I wish I could rub that belly!! ;) You look great! How the HECK are you already 20 weeks??! Eeeep! Can't wait to meet that sweet boy and see how you decorate G's new BIG BOY room! Yay! I'm so glad you got all of the sleeping arrangements worked out! I can't wait to see the new nursery! Loving your progress! When I read the line about the stocking, I totally thought PBK was Baby Dos' initials - ha! It's too early. :) Can't wait to see the updated nursery and new room for G! That's the bed I was trying to explain to you. Love it! So glad you have it all figured out. You're going to have so much fun with those little boys.